This incredible hotel seamlessly blends valuable fin de siècle antiques with modern comforts to create the ultimate urban retreat. With room decorations ranging from Art Déco to classic luxury, the hotel offers every modern amenity without sacrificing style or culture. Every room is equipped with Wi-Fi and a flat screen television, and many rooms include walk-in closets. The hotel is in the heart of the city, just minutes from the city's premier entertainment, culture and shopping locales including the Vienna State Opera and the fabulous Kohlmarkt. 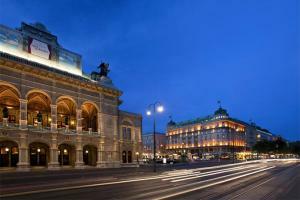 Located right next to the Vienna State Opera in the city's business hub, just minutes from the Main Station Vienna.